We suggest that you always have at least one copy of your data downloaded. How often you'll want to generate and download a Full cPanel Backup is ultimately up to you and would depend on how often your site data changes. It is also possible to download backups of individual databases via the "Backup" section of the cPanel as well as individual files and folders via the "File Manager". 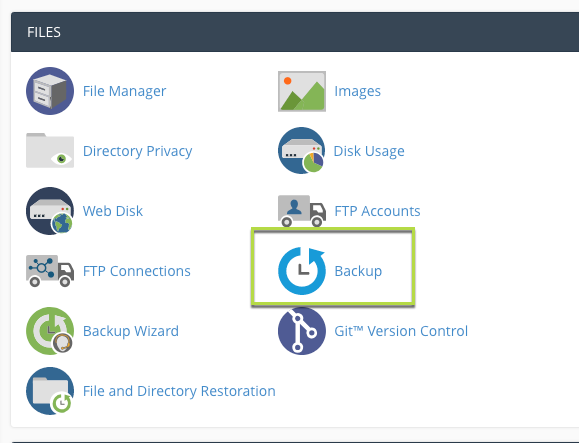 You can generate and download a full cPanel backup from right in your cPanel. You will want to find the option called "Backup" under the "Files" header. Inside of the "Backup" section you will see the option "Full Backup" with the button below that which says, "Download a Full Website Backup". You will want to click on this button. On the next page you will see a "Generate a Full Backup" section. Under this section you will want to click "Generate Backup". Once you have done this you will see the backup as in progress. If you've selected for it to do so - it will email you when the backup is completed. To download the backup you can re-visit this page once it is completed and there will be a link to download the file. You can also download the file from your home directory via the File Manager or FTP.